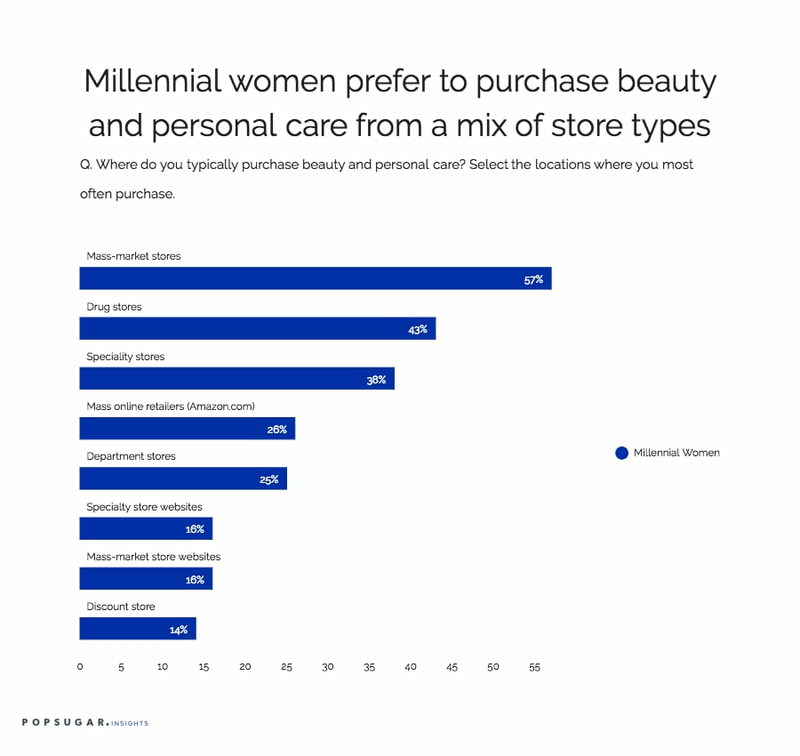 Millennial women shopping for beauty and personal care products have an abundance of choice when it comes to where they can purchase beauty products. From online channels to offline channels like mass, department, and drug, women have the ability to purchase from anywhere they choose and therefore are more driven to buy based on drivers such as price and convenience. As part of the POPSUGAR Insights study "Beauty Evolved: How Millennial Women Shop for Beauty and Personal Care," we asked women to tell us where they most often purchase beauty and personal care products and what drives them to select specific channels. Overall, 73% of millennials typically purchase beauty and personal care products at a mass-market store, website, or mobile application. Over half (55%) of millennial women enjoy purchasing beauty and personal care products from a speciality story, website, or mobile application, such as Sephora, and 52% prefer to purchase from a drugstore, drugstore website, or mobile application. Approximately one in five millennial women typically purchase beauty and personal care products from a discount store, website, or mobile application. Next, we asked women to tell us why they prefer to purchase from those channels. Overall, price and the opportunity to obtain discounts ranked highest overall. Over six in 10 millennial women (65%) said that price was the key driver when it came to deciding what type of store they typically purchase from, and 36% said that they are influenced by a sale or promotion. Convenience is also a key driver that spurs millennial women to purchase from specific channels, as 45% cited the store location as important. For online channels, 45% of millennial women select shipping benefits (free shipping or fast shipping) as an influencing factor in determining channel selection. Although price and convenience rank highly, quality and shopping experience matter to millennial women. Forty percent of millennial women we surveyed said that they select stores based on the product quality, and over one in three women said that product availability (38%) or having a prior positive experience with the store (33%) are important. Store reputation also matters to one in five women. Perhaps surprisingly, only 21% of millennial women cited that customer loyalty or rewards programs were a key driver in helping them select where to purchase. Loyalty programs were 15% more important to women between the ages of 35-49.